Congratulations to Barry M Gough who has been awarded the 2015 Mountbatten Maritime Book Prize. You'll be £35.00 closer to your next £10.00 credit when you purchase Historical Dreadnoughts. What's this? This is the story of the remarkable, intersecting careers of the two greatest writers on British naval history in the twentieth century – the American professor Arthur Marder, son of immigrant Russian Jews, and Captain Stephen Roskill, who knew the Royal Navy from the inside. Between them, these contrasting characters were to peel back the lid of historical secrecy that surrounded the maritime aspects of the two world wars, based on the privileged access to official papers they both achieved through different channels. Initially their mutual interests led to a degree of friendly rivalry, but this was to deteriorate into a stormy academic feud fought out in newspaper columns and the footnotes of their books – much to the bemusement (and sometimes amusement) of the naval history community. Out of it, surprisingly, emerged some of the best historical writing on naval themes, and a central contribution of this book is to reveal the process by which the two historians produced their literary masterpieces. Anyone who has read Marder's From the Dreadnought to Scapa Flow or Roskill's The War at Sea – and they were both bestsellers in their day – will be entertained and enlightened by this story of the men A J P Taylor called 'our historical dreadnoughts'. Overall this book is a very useful introduction to the work of two of the finest English-speaking historians of the first half of the 20th century. This book will no doubt provoke a renewed interest in both authors' major works with a re-read by previous readers or a demand for a first read for those who had not. In this respect alone it is highly recommended as a two-person biography but it is also an extremely interesting introduction to these two major works. Historical Dreadnoughts is a unique record of the recording of the two great maritime wars of the 20th century. The book is recommended to the reader who seeks a different light on the great actors and events of the wars at sea. This very thorough and eminently readable book is the story of the lives and interactions of the two great writers on twentieth century British naval history, the successors to the legendary Alfred T Mahan and Julian Corbett. A book about naval historians and their differing approaches to writing history might be dry and dull, but in the author’s capable hands (as a Canadian, he is neutral in the dispute) makes a fascinating read. It is a naval book with a difference and one that cannot be too highly recommended for the bookshelf. The author provides a fine grain narrative and assessment of the challenges faced by the historians and it is this material which gives the reader of historical Dreadnoughts an appreciation how the great events of RN wartime history were jealously guarded by the participants and government officials alike to preserve reputations and minimise controversies. This analysis provides a valuable background to serious readers of RN history which is not apparent in the published histories. The narrative also describes the great stresses the historians experienced in working at a frenetic pave with particularly affected Roskill’s war injuries. The Canadian Nautical Research Society is pleased to announce the winner of the Keith Matthews Award for a book published in 2010. It is made for the best book by a Canadian on any maritime subject, or by any national on a Canadian maritime subject. As I started to get further in to this book, two aspects of the entire affair became apparent. The first is, what a terrible shame that two such eminent naval historians should devote so much of their valuable time attacking each other. it seems, at times, that they did co-operate. however the constant disagreement dragged on and people were obliged to take sides. What were they at loggerheads about? You may well ask. Can a period of history belong to one historian? Was a gentleman's agreement broken? This book does appear, prima facie to come down on the side of Harper. Much of the struggles between Marder and Roskill were over the Hankey diaries and over the interest of the roles of Churchill and Pound in the course of the Second World War, but each accused the other of breach of copyright or not returning papers. Whatever your views this is a serious study that throws light on the background and careers of both men who between them have contributed so much to Naval history and as such deserved a place in any Naval library. This book provides an important contribution to this campaign and the production of a more balanced view. It is based on much research and it is well written. It should have had a rather longer epilogue but is a most worthy work nonetheless. If you want to understand the dramatis persone and dynamics of naval historical writing in the mid-to-late 20th Century you need to read this book - but do so critically, and more needs to be said. This is an unusual topic for a book, containing biographies of two of the most important naval historians of the Twentieth Century and a look at feud that developed between the two men as they approached the peak of their careers. Marder and Roskill were very different figures. Marder was the Harvard man, an academic who served very briefly in intelligence during the Second World War, but spent much of his career travelling between his university base in Hawaii and archives in Britain. Roskill was a Royal Navy officer with a fairly distinguished career that included some frontline service during the war before being cut short by deafness caused by repeated expose to gun fire when in charge of the guns on HMS Warspite. At first the two men seem to have got on quite well, at least for as long as their areas of interest didn't overlap. Marder was interested in Jackie Fisher and the First World War navy, while Marder wrote the Official History of the Royal Navy during the Second World War. Once they both began to look at the interwar period the rivalry became more intense, and after a particularly unpleasant argument over access to the Hankey papers their professional relationship broke down (although they continued to correspond on a fairly friendly basis to the end of their lives). This book will have a rather wider appeal that you might think from the subject. In the process of discusses Marder's and Roskill's work, Gough inevitably provides a great deal of information on the topics they were studying, and the way in which thinking on their main topics developed over time. These sections will thus be of value to anyone interested in the Dreadnaught era, Fisher, the British navy in the First World War, or to anyone who has used Roskill's Official Histories of the fighting during the Second World War. The book should also be of interest to anyone interested in the writing of history, and military history in particular. There is some excellent material on how both men gathered and used their sources, and their approaches to the writing of history - particularly of interest in the case of Marder, who had to engage with the academic trends of the late 1960s towards the end of his career. There is also an interesting comparison of the different problems faced by official and unofficial historians - Roskill had easy access to the Navy's archives, but some limits on what he could say, while Marder had to struggle to gain access to the First World War archives, but was less restricted in what he could do with his sources. This book is the story of the intersecting careers of Arthur Marder and Stephen Roskill, two of last century's greatest writers on British naval history. Between them, these contrasting characters peel back the lid of historical secrecy that surrounded the maritime aspects of two world wars based on their access to official papers. BARRY GOUGH was professor of history at Wilfrid Laurier University in Ontario until retirement in 2004. An expert on the maritime history of the Pacific Ocean, he has published widely on Anglo-Canadian naval subjects. 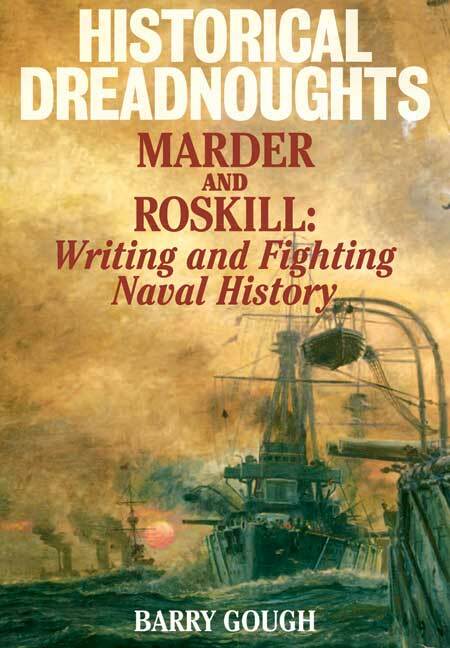 His dual biography, Historical Dreadnoughts Marder and Roskill, was published by Seaforth in 2010.